This set only have 8 powers of the game and it is all printed on the mini poster found within the capsule. Ain't they cute? There are 2 different type turtle shell in Mario Kart. A Green and a Red one. Shells are generally uses to strikes a competitor but sometime you can use it as a defensive weapon to fence off offensive Shells. 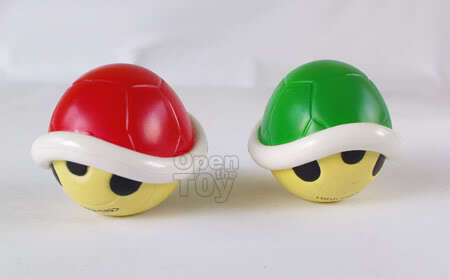 The Green Shell in Mario Kart generally move straight but can bounce off walls to side to side. 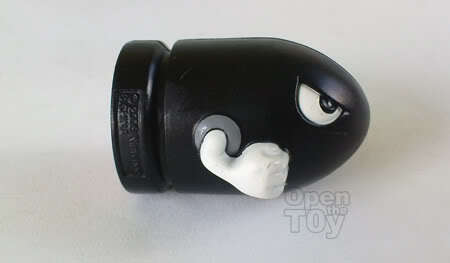 It can be used to destroy a banana in the way or other offensive incoming shell at a right timing. 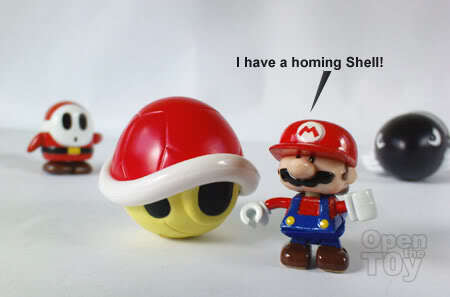 The Red Shell is deadlier with a homing ability. 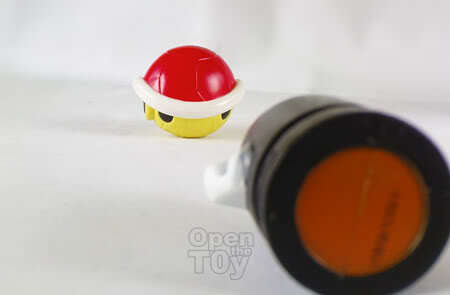 When fire off, the red shell will target on the competitor ahead or behind you depending on where you aim. 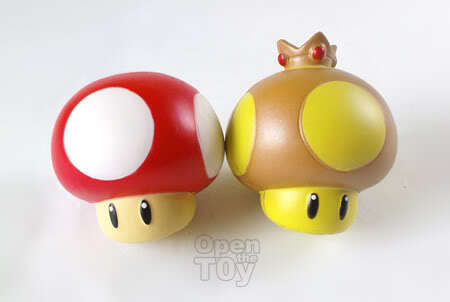 When we see Mushroom, we know for sure that give Mario power. 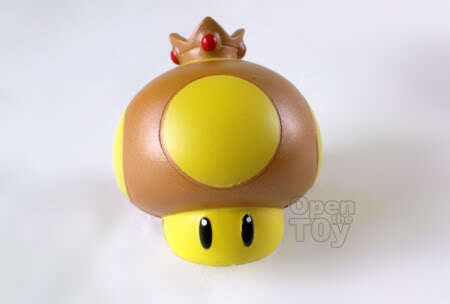 Here's a regular Mushroom in Mario Kart. 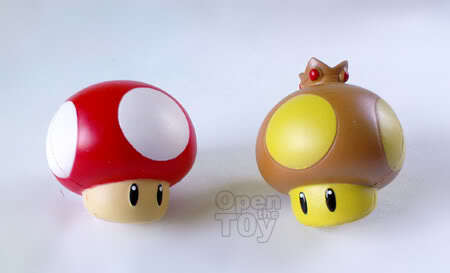 Activate the mushroom in the game and you’ll receive a short speed boost. One mushroom for one speed boost. It's a fair game. Then there is the Golden Mushroom. It provides the same speed boost effects of a regular mushroom but you can be uses it anytime you like within a limited time period a upon the first activation. 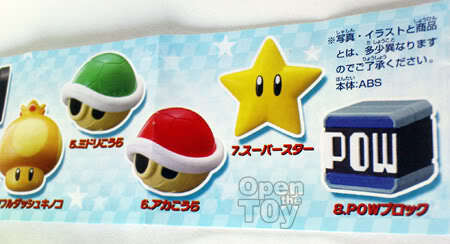 Have I told you that these 8 power gashapons have magnet inside them? See how they snap together. The Lightning Cloud in the Mario Kart is a double edges sword. It will first give you a speed boost for a couple of second before you start slowing down and shrunk in size and finally get a lightning strike on you. 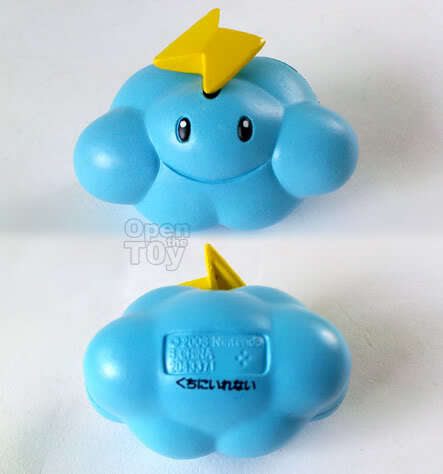 Fortunately, the lightning cloud can be pass to other racer by contacting them. So pass it on within the time limit. When this power is activated, you will transforms into a gigantic bullet and flies in autopilot mode down the track and knocking down any other racers in the way for couple of seconds. A great way to catch up if you are falling behind. Normally this power only given to the last few players falling behind the race to catch up. Fair? Go knock the shell Bill! 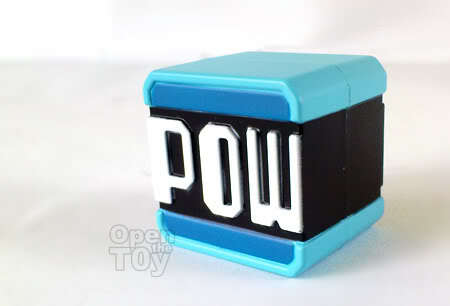 This POW block can shake anything on the ground. Once activated, the timer will begin to count down. When it hit zero, the other racers will spin out of control and lose their item inventories except the user. 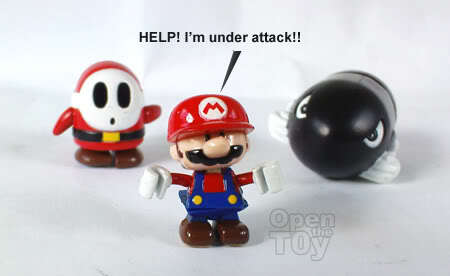 In the old Super Mario game, it can over turned the turtles. Feel the power! 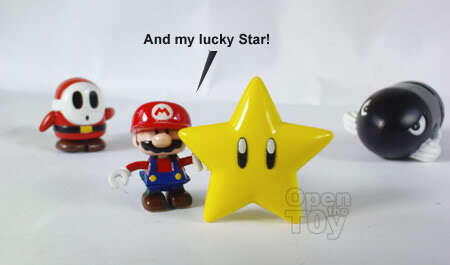 If all the power above are to your disadvantage, this item will be your lucky star. Like all Super Mario series, you will be invincible in the racing game regardless any power are at work in the race against you with a speed boost. The power of course has a limited time period. You are however not invincible if you drive off into the cliff. But for other things else, there is the STAR! 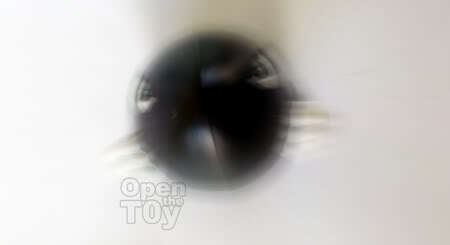 For the toy wise, it is 2D instead of 3D if you know what I mean. Overall I love everyone of them. Okay I am going to end the review here but how can we left out our main character Super Mario right? 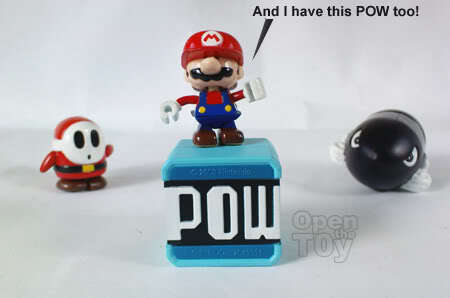 Here is a bonus for the weekend post, My Super Mario!! 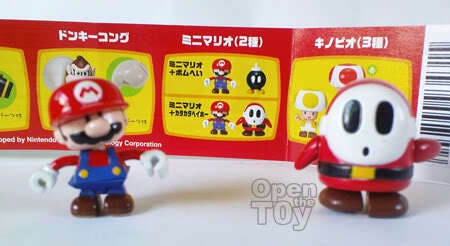 He is from another series of the Gashapon. 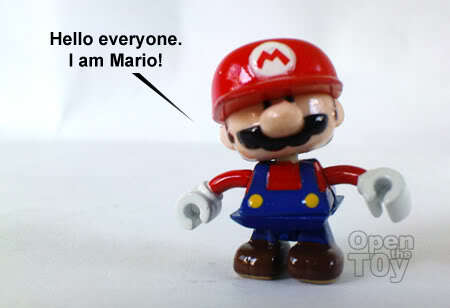 Mario is not alone. 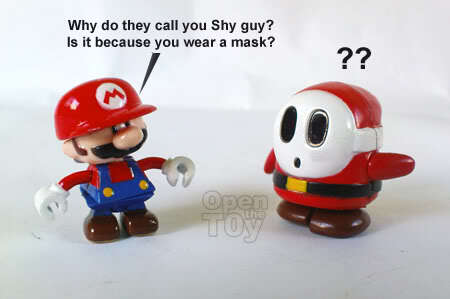 He came sharing the same capsule with the shy guy. Yes that is the question I want to know too. "Bad boys, Bad boys. What you gonna do? What you gonna to when they come for you?" "You must be my Lucky Star"... "I should be so lucky, lucky lucky lucky..."
I have to stop before I keep going on sing every song that come to mind. Finally, a group photo for my collections to end the review. Look this way and say Cheese! *Snap! My goodness! Star just went FLAT again!!! #$@! These are so adorable! 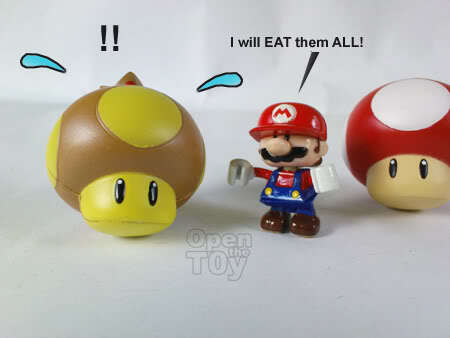 I like the mushroom the most. Till today, Super Mario game is still fun and entertaining. i always think Mario is a very cool game to play, it's so much fun and adventurous.. the traditional 2D one is already very good, and i suppose the 3D ones (and with today's technology) it is even better!! Indeed and the good part is that they keep adding games type using Mario and the response is good. Even today when you play the old game in Nintendo, it is still fun. i played mario galaxy a lot wen is still had my wii. 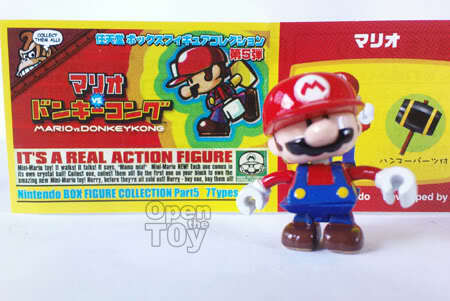 i love mario so much we have a special self with mario figures. Run little mushrooms! 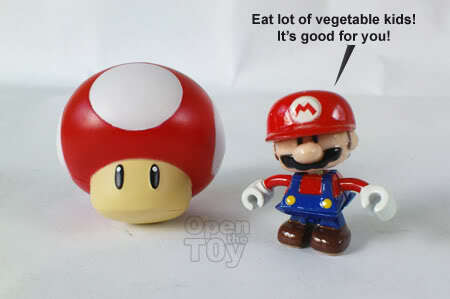 Run before Mario devours you! 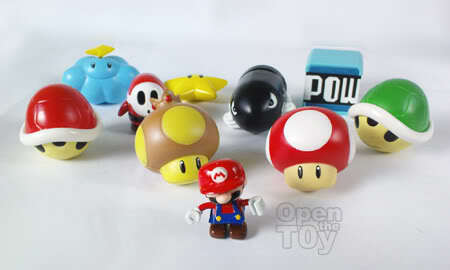 Leon, I like the mushroom, power bullet and the power block. They are cute. I play MARIO games but not very good..
You got quite a good Mario collection yourself. Interesting! Cool little magnest, liking the mushroom. Can't help but think there cute.